Our mission is to enrich the lives of people with developmental disabilities and youth in residential care by developing better resources, educating communities, and creating programs to serve their needs. 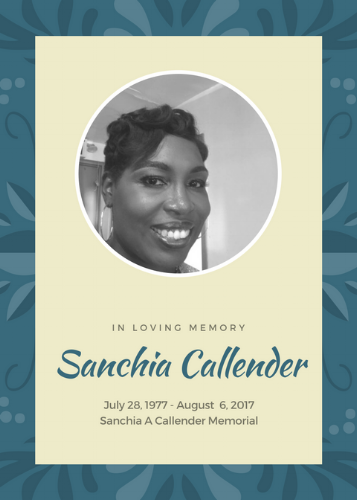 Incorporated in 2017 in the wake of the loss of a kind and loving woman, Sanchia A Callender, Inc builds on her legacy of service, compassion, and integrity. We serve as a vehicle to continue supporting the people and work Sanchia did during her lifetime. Sanchia worked with adults with developmental disabilities and served as a counselor for hard to place youth in residential care. Her compassion and dedication to competent trauma informed service informs and inspires our work. Sanchia A Callender, Inc is a 501(c)(3) nonprofit organization.